Darien's Kristen Gilbert in action as Darien High School hosts Staples in a girls lacrosse game in Darien, Conn., April 10, 2012. On one level, it was probably too early for the Darien and Staples girls lacrosse teams to meet. For the Blue Wave and Wreckers to battle in the second week of the FCIAC regular season is like the New York Yankees and Boston Red Sox clashing in April. It's a nice rivalry, but the impact is muted this early in the year. 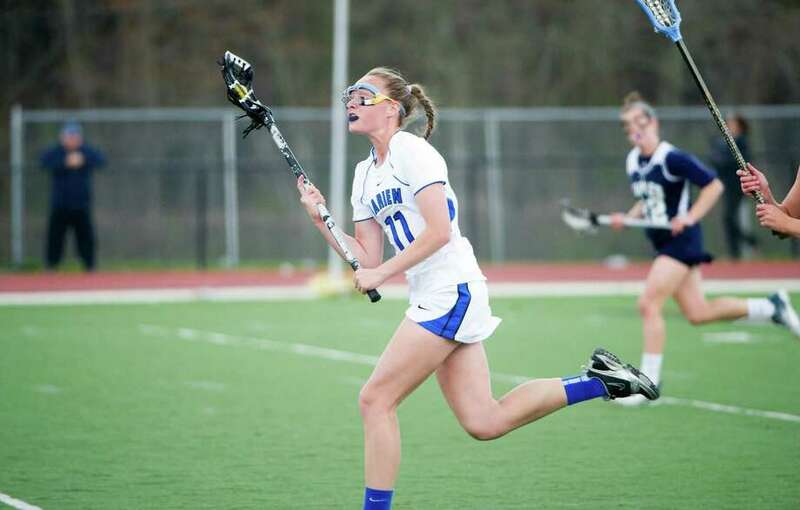 The good news was both head coaches got an honest assessment of where their teams are and what they need to work on Tuesday as Darien remained unbeaten thanks to a 14-10 triumph at the Blue Wave stadium. "We played well in spurts," said Darien head coach Lisa Lindley. "We had some defensive breakdowns. Offensively, I liked the pressure we put on Staples in the middle of the field. And all the priority work we did in the preseason on faceoffs paid off." Indeed. Darien (3-0, 3-0) won the majority of faceoffs allowing them to maintain ball possession the majority of the afternoon. The Blue Wave's height and athleticism -- especially on defense -- made Staples (2-1, 1-1) work very hard for its goals. Darien was in control after scoring five consecutive goals to build a 9-4 halftime edge. Staples got as close as 11-7 the rest of the way. However, Staples head coach Cathy Schager saw a large group of silver linings in the Wreckers' effort. "We've never scored 10 goals against Darien, so I consider this the best game we've ever played against Darien," Schager said. "What I liked most was our young kids trusted the system we want to play. Darien is a machine. Now we know what we have to work on to get to that level." The Blue Wave had too many weapons for Staples' defense and goalie Kirsten Flicker (six saves) to deal with. Taylor Hardison scored four goals and Hollis Perticone collected four goals and two assists. Jena Fritts finished with two goals and four assists while Emily Stein added two goals and two assists. "This is an interesting group. A lot of our young girls are returning starters while some of our seniors are on the second unit right now," Lindley said. "We have to progress to build our depth as the season goes along." Darien likes to play a strong non-conference slate and will be tested in its next stretch at Loomis Chaffee, at Garden City (New York) followed by home contests with New Canaan and Manhasset (New York).